If you are a Blackjack player then there are more than enough different variants available to play online and as such you will have plenty of fun when you try out several of the different Blackjack games on offer to you at any online casino site you have signed up to and have chosen to play at. 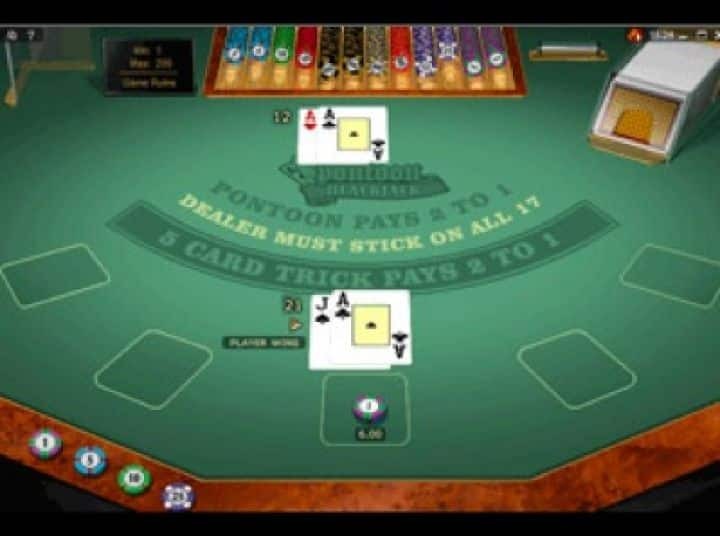 One Blackjack related casino card game which is slightly different to most other variants is Pontoon, at one time Pontoon was the most played casino card game, however over the years with more and more different variants becoming available the popularity of that game has somewhat declined. However, there is not getting away from the fact this is still and very playable game and with that in mind we shall now let you know what the game has to offer you and how you can play it. The first thing that you will need to do when you come across a Pontoon game online is to decide just how much you wish to wager on each hand you play off. You will find both single hand and multi hand Pontoon games on offer to you and as such you should first decide whether you wish to play a single hand game or one that will let you play off several hands all at the same time. You will then need to select a stake option when playing Pontoon and the way you do that is by adjusting the value of the chips by clicking onto the chip value control button on the games playing panel. You then need to position your mouse over the betting box displayed on the layout of the game and click, each click of your mouse will place one chip onto that betting box. The next thing you need to do is to click onto the deal button when you have chosen your stake amount and the game will then deal out two randomly selected cards and the Dealer will also be dealt a face up card. You need to compare your hand with the one card the Dealer is showing to determine the best way to play off your hand, and you will be given a range of different options via a set of playing control buttons one of which you must press to play off your hand. The name of all of the betting options you can pick and choose from when playing Pontoon are ever so slightly different come the betting options you will have available when you are playing Blackjack, so we shall not let you know what those betting options are. To hit your hand you must click onto the Twist button, if you wish to double down when permitted by the game play rules then the button you must click is the Buy button. The stand button on the game of Pontoon is the Stick button. Apart from those three buttons all other ones share the same name as Blackjack games!